Since the release of their concept album, “The Ascetic Paradox’ (TAP) four months ago, Sri Lanka’s very own Heavy Metal powerhouse, Stigmata has been on a roll. 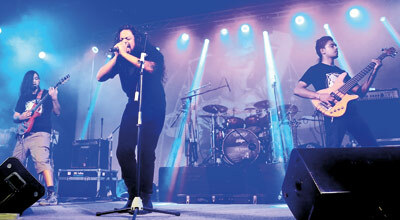 With positive reviews streaming in from across the world, the band will take the stage again next Saturday, February 27 at the Colombo City Hotel to celebrate a decade since the release of their second album, Silent Chaos Serpentine (SCS). Stigmata amassed a large following in the country with the release of their first record, ‘Hollow Dreams’, but it wasn’t until their second album SCS in 2006, that they went on to achieve greater heights. SCS took Stigmata to another level internationally. It was soon reviewed by USA’s www.tmetal.com and one of Australia’s leading Heavy Metal sites back in the day, www.metalforge.com. The band remained on a CD reviews poll for over two years on metalforge and peaked at No. 9 on the site’s top 50 reviews of all time. In October 2015 they launched The Ascetic Paradox. The various musical styles that the album managed to capture, combined with the lyrical concept showed that TAP was following in the footsteps of its older brother, SCS. As reviews go, these weren’t the only ones that stood tall, for TAP was soon to receive positive vibes from the United Kingdom. “Hard rock meets metal with a thumping backdrop”, was the underlying statement in UK’s ‘The Moshville Times’, analysis of TAP. This was followed by the blog naming Stigmata the band of the day on January 8, 2016. This week Stigmata was locked away at rehearsals, prepping themselves to put on an epic show, on Saturday. Joining them at the show will be local Metal powerhouses, Killfeed, Mass Damnation and Constellation. The Sunday Times caught up with Shafeek Shuail, the lyricist and rhythm guitarist of Killfeed, a thrash metal band that broke into the scene back in 2009 and Ryan Johnson, the vocalist of Mass Damnation, a local groove metal band who are both looking forward to performing with Stigmata. “My band mates and I grew up listening to Stigmata. We have all dreamt of playing with them on the same stage and we saw that dream come true back in 2014,when we played alongside them at “Dying winter sleeps”, Shafeek tells us. According to him, SCS was ‘THE most amazing Sri Lankan metal album after Hollow Dreams’. He recalls that ‘Lucid’, ‘Jazz Theory’, ‘Swinemaker’ and‘Forgiven and Forgotten’ were the songs that he and his mates used to play at school every day. “We were too young to attend the SCS launch concert and up until Suresh gave me the CD, I never knew where to find a metal album in Sri Lanka,” Shafeek reminisces with a chuckle. This will be Mass Damnation’s first performance alongside Stigmata. “It’s also quite an honour to be asked to play on the stage that is commemorating Silent Chaos Serpentine,” Ryan tells us. He adds “We grew up to this album. Right after ‘Hollow Dreams’, this is the one that made an impact on everyone getting into the metal scene. “I was at the SCS launch concert in 2006 and I have to say, the experience was amazing. The ambiance and the energy was mind blowing, and the album is still inspiring generations to come,” he says. The stage is set and all the bands are geared up and ready to do justice to a decade of Silent Chaos Serpentine. Tickets for the show will sold at RS.1000 at the venue and will be presold for Rs. 800. The early bird tickets are available at the Colombo City Hotel, TNL Radio and from the organisers.